Filter files according to a configurable white list policy: only allowed file types can go through. Recognizes the most common file formats: HTML, text, PDF, RTF, MS Word, Excel, Powerpoint, Project, Zip, JPEG, PNG, GIF, BMP, AVI, WAV, MP3. Recursive analysis of files into containers such as Zip. The output of the filter is only clean files with a recognized/allowed format, no active content, no executable file. The risk of launching malicious code is dramatically reduced. Can integrate antivirus engines such as ClamAV (clamd) or F-Prot for increased protection. Portable: runs at least on Windows, GNU/Linux and Mac OSX. Fred Raynal's presentation about malicious PDF at hack.lu 2009 (ExeFilter is presented slides 34-39). Previous presentations in French about file formats security and ExeFilter are also available here. 2010-02-24: version 1.1.2 published, see changelog for details. see also news on project website. On Windows, pywin32 is required (Python for Windows extensions). 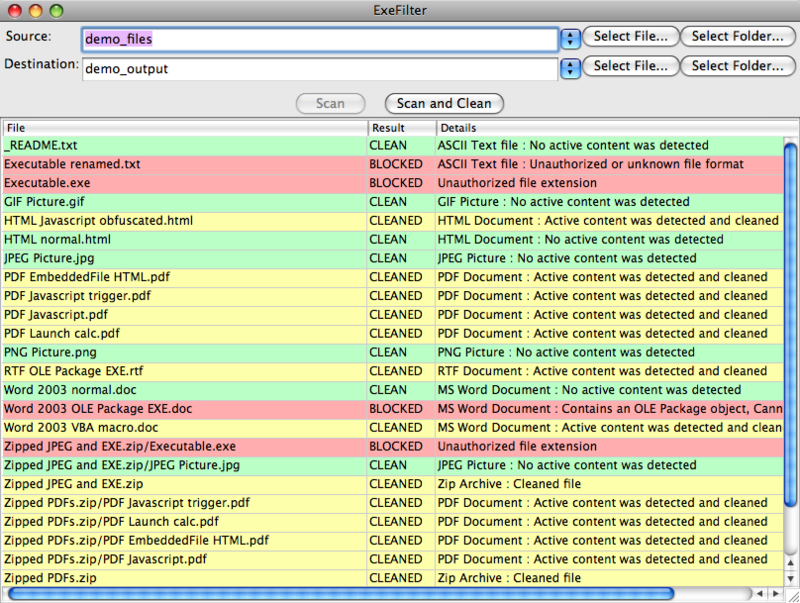 ExeFilter is provided with a few sample files located in the demo_files folder. 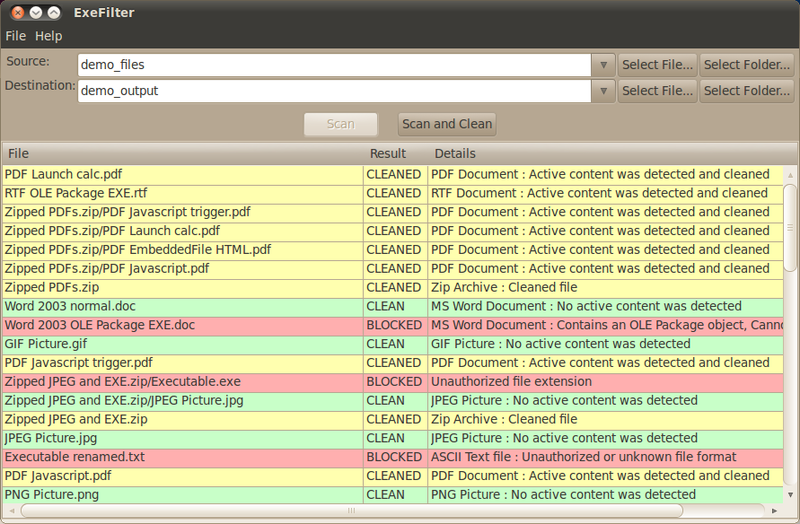 If you have wxPython installed, just run ExeFilter_GUI.py, then click the "Scan and Clean" button. Then open each file in demo_output, and compare results. It is possible to sanitize the file in place, by specifying the same path for source and destination. ExeFilter returns different errorlevel values according to the result (clean, cleaned, blocked or error - see documentation), which may be used to automate its usage in a gateway. Source path may be a directory, a single file, or a list of directories and files separated by spaces. Destination path must be a directory. Then the policy.ini file may be edited using any text editor in order to modify options and filtering policy. For more information, see the current documentation. Send an e-mail to decalage(at)laposte.net if you would like to contribute to the project, send patches, bug reports, develop new filters or simply tell us you have tested the tool on a specific platform. Does your tool provide support for MS office 2007 onwards, i.e. Open XML file formats? Yes, Open XML formats are supported since version 1.1.4-alpha6. The documents are scanned and cleaned like zip files, allowing XML files and pictures inside (according to the configured policy). Any other binary file within the archive (e.g. macros) are stripped out.